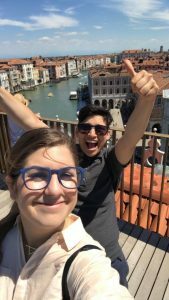 We recently caught up with SAI University Relations Associate, Clau, who shares some insider tips on the famous town of Venice. I absolutely love Venice. It is a unique city which, unfortunately, gets a bad reputation of ‘too crowded’ and ‘cruise line infested’. Known as “La Serenissima” (The Serene One), I always try to make my visits as relaxed and serene as possible and I love introducing people to this magnificent place. So when Rome Assistant Program Coordinator, Arianna DiCicco, told me she’d never been to Venice, I immediately planned a 28hour visit that avoids the crowds as much as possible while still hitting the highlights and areas often overlooked by tourists. Below find 8 ways to visit Venice like a local. After dropping off your bags for the weekend. Dive right into the heart of Venice for lunch. 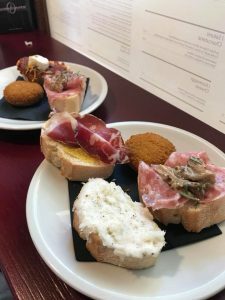 Naranzaria in Campo Erberia – has two options: seating outside for a sit-down lunch with views of the Grand Canal or a quick lunch of classic Venetian Cicchetti (toasted bread with various toppings) and a Spritz at the bar. Bellies filled, head across the famed Rialto Bridge towards department store Fondaco dei Tedeschi for a panoramic view of Venice. Peruse the various floors to get a taste of European high fashion or stop for a quick ‘cafe’ at the bar on the ground floor. 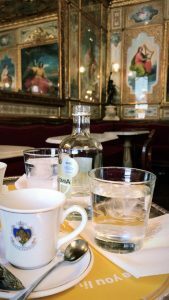 While you wait for your entrance time head over to the historic Cafe Florian for a coffee, tea, or water. Note: if the orchestra is playing outside there will be an increased fee. Make sure to stay and enjoy your drinks for as long as you want. Most people complain about the crowds in Venice. But it’s fairly easy to escape the crowds and find some solace. Grab a gelato, some fresh fruit from a local fruit stand, or a cool water and sit along a canal, in a park or one of the many ‘campi’ (squares). Asst. Program Coordinator Arianna DiCicco and University Relations Associate Clau Castaneda taking in the views! Grab a vaporetto pass if you plan to take more than 2 rides on the cities public transport system. Each ticket (valid for ‘90 minutes in 1 direction) cost a whopping 7 euros each. A 24-hour pass will give you unlimited access for 20 euros. Venezia Unica lists various options from 1 to 7 day passes as well as other discount card options. If you plan to visit the islands, this is a great option. And allows you to see the city from a different perspective. Tip: Plan your vaporetto use. If you get a 24-hour pass, note that the time on the ticket or pass starts when you first validate the ticket. Validate at 10am? That means it’s good until 10am the following day! Tickets are validated by tapping them against the digital machine outside each dock entrance. A short 20 minute vaporetto ride from Vaporetto Stop F.te Nove and you’ll be on the Venetian island of Murano, known for its master glass blowers. Check out the Glass Blowing Museum or wander into one of the many Fornace like ‘Vetreria Artistica Emmedue’ that sometimes offer free glass blowing demonstrations. Or stroll the canals with a gelato and shop for some certified Murano Glass (Look for the Vetro Artistico Murano label). Vaporetto 4.2/ 4.1 rom F.te Nove “B” will get you to Murano. Burano is another famed Venetian island. Known for its colorful buildings. However, it is also known for delicate lace work. Make sure to stop by Martina Vidal and ask to see their small Lace Museum. Great place to get an Italian made souvenir (bookmark, handkerchief, or scarf). Then explore the colorful sights of the island, including Artist Bepi’s historical house! Then grab either lunch or dinner at Trattoria Nero (be sure to book in advance! Send a follow-up email for confirmation). If you opted for the vaporetto pass, don’t miss out on Giudecca. Often overlooked, this island offers a quiet and serene part of Venice. Stroll through the neighborhood ‘calle’ and canals and enjoy a view of Venice from the opposite side of the lagoon. And then grab a lunch in the boatyard at Ristorante Al Storico da Crea for some fresh seafood! Google Map: This handy custom Google Map can help you put it all into context! Clau is currently SAI's University Relations Associate, based in Sacramento, CA. Clau previously was SAI's Milan Program Coordinator for 5 years, and also studied at SAI host school NABA. Clau’s travel philosophy is tied to a Terry Pratchett quote: "Why do you go away? So that you can come back. So that you can see the place you came from with new eyes and extra colors. Next time I’m in Venice, I’m bringing your map! So many things I missed :0 Thank you for such a comprehensive overview with such fine detail and inspiration.